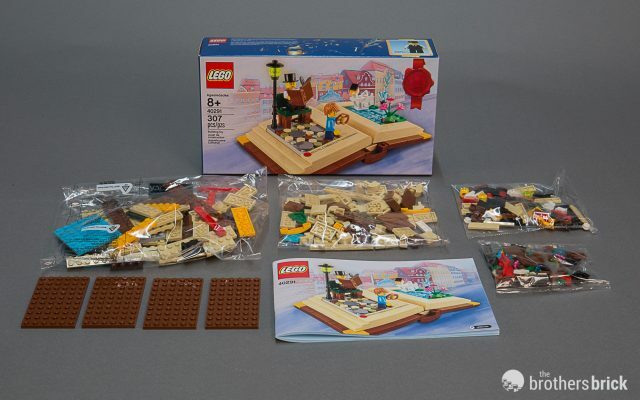 The simple box (we have more photos of the box in the full gallery at the end of the article) includes four unnumbered bags, along with four 6×8 brown plates and the instruction booklet loose in the box. 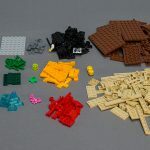 While the set doesn’t include any completely new molds, it does have quite a range of parts in natural colors from brown and tan to light orange and azure. The build begins with the book’s spine, built from 1×4 rounded arches and various plates. 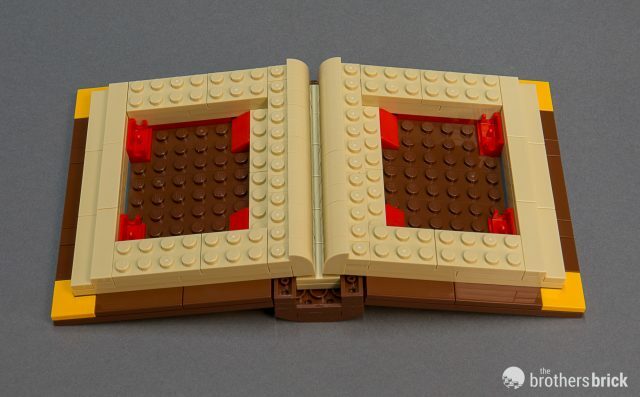 Next, you build two identical sections for the book’s front and back covers, attached to the spine with clips. 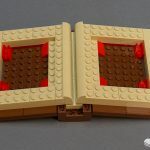 Pages are built from tan plates and tiles, leaving a space for the two scenes that drop in later. 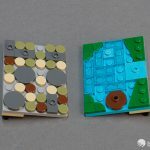 Each of the two scenes is built on a 6×8 plate, with 1×1 and 2×2 round tiles serving as cobblestones for the village scene and trans-blue tiles on an azure base for the pond. 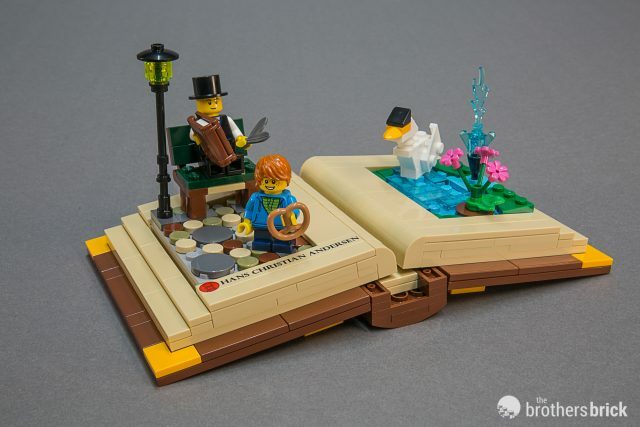 The scenes are attached to the book covers with hinges, allowing the scenes themselves to sit flat when the book lies open. More tan tiles partially cover the bases for the scenes. 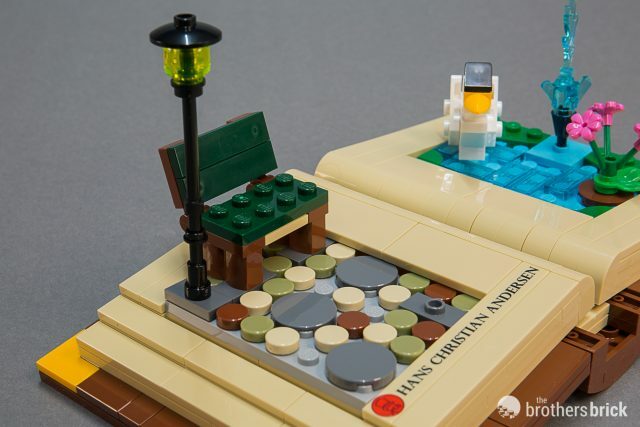 A brick-built swan with bits of foliage complete the swan scene and a park bench and lamp complete the village scene. 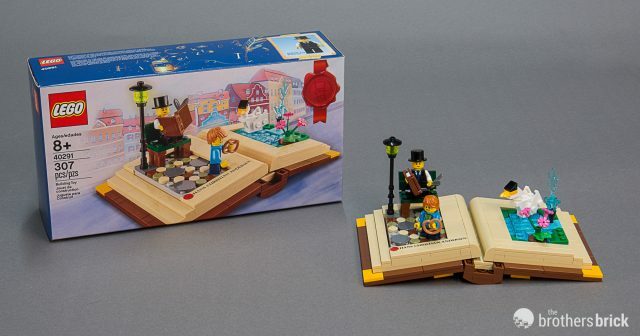 Notably, the set includes two unique printed elements, a 1×2 tile printed with “Once upon a time” and a 1×8 tile printed with the writer’s name. 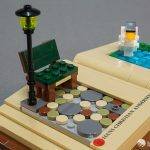 Sitting on a flat surface, the completed build looks like a pair of scenes in two frames, though the fact that it’s a book is evident from the stepped “pages” on either side and the curves in the center. 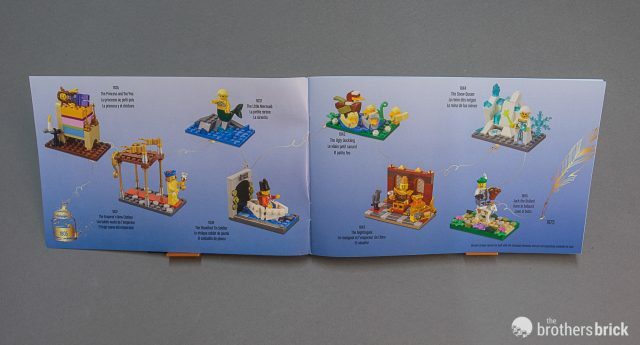 However, it’s really the build process in which you build the covers and the pages that really reinforce this. And using white instead of tan might have made the finished model look more obviously like a book. But I like old books with faded pages, so that’s what I’m choosing to believe this is. I have to admit that I’m not really a fan of the brick-built swan. 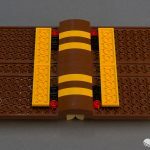 Using more curved shapes like white minifigure hair and smaller curved arches for the neck would have resulted in a much more organic shape. 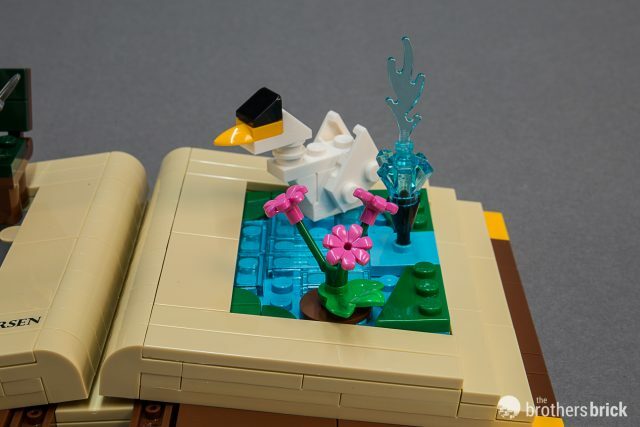 As it is, the white swan is more than a little blocky. 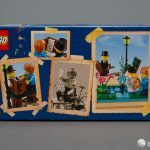 The two minifigures don’t really include any new or unique parts, but this is normal for promotional sets. 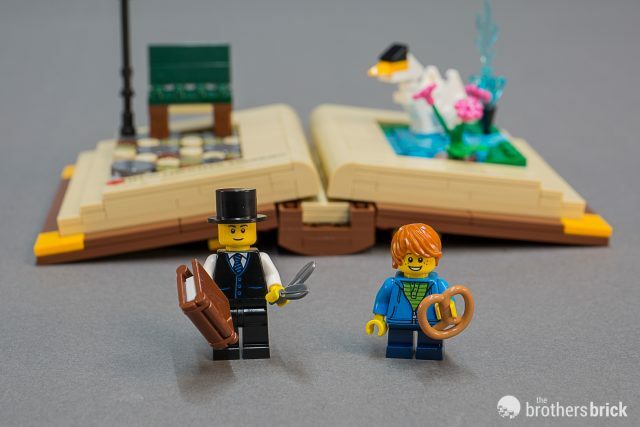 Nevertheless, accessories like the book and pretzel are welcome additions to any collection. 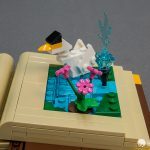 It’s a brief but fun build, despite some reservations about a few of the brick-built details (like the swan). A 307-piece set would often be sold for $30 or more, so getting all these parts in various natural colors, with some nice foliage elements and a couple unique printed elements, is quite a good deal for a $100 purchase. 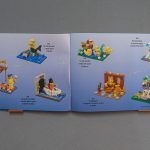 40291 Creative Personalities includes 307 pieces and two minifigures. It’s available now through June 20th, or while supplies last. As I posted on another site.. 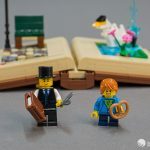 This is a great set with two very lazy minifigures. 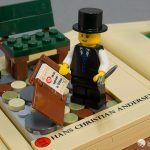 If this set featured an actual ‘Fleshy’ style minifigure which was actually supposed to be Hans Christian Andersen this is a day one purchase for me, maybe even two. 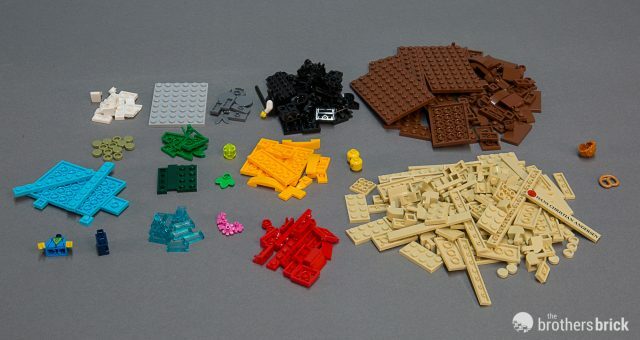 As it stands it’s a bunch of minifigure left over parts. 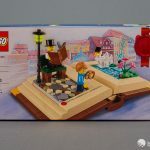 Looks like a great build with fantastic longevity due to its design of having interchangeable “page” scenes! Also, that’s a huge amount of bricks to be getting for free — is that the biggest set that’s ever been a free add-on for LEGO shop purchases? I think this is awesome. 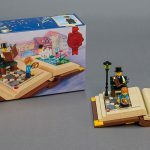 Nice review, for a cool and unique set. 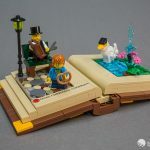 The ‘once upon a time’ tile can be found in other sets, most notibly the Disney Castle. ^ Ah, I’d missed that. Thanks! 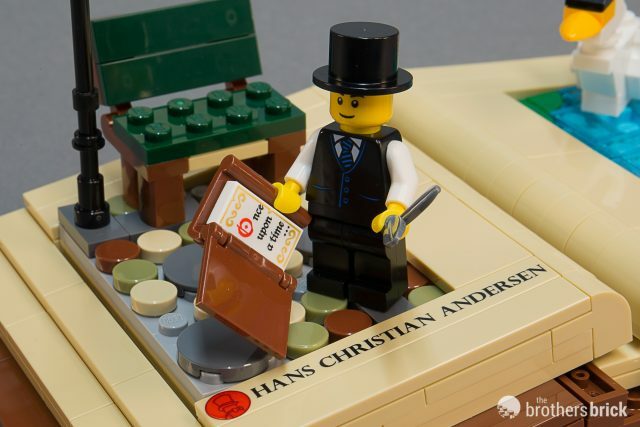 The biggest free add-on by brick count seems to be “40290-1: 60 Years of the LEGO Brick”, released earlier this year. 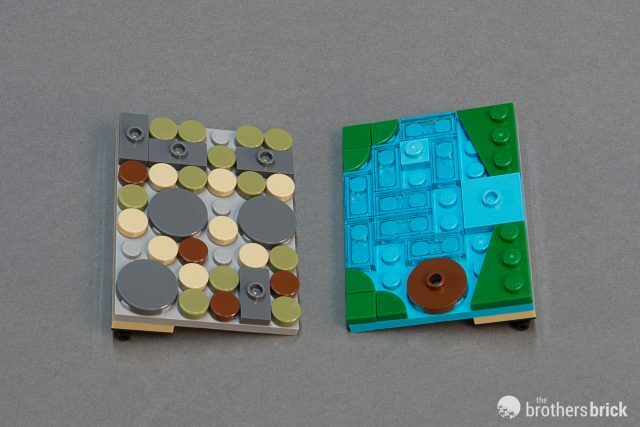 Does anyone know if they plan on coming out with the “mini-models” that they show on the first of the build booklet. 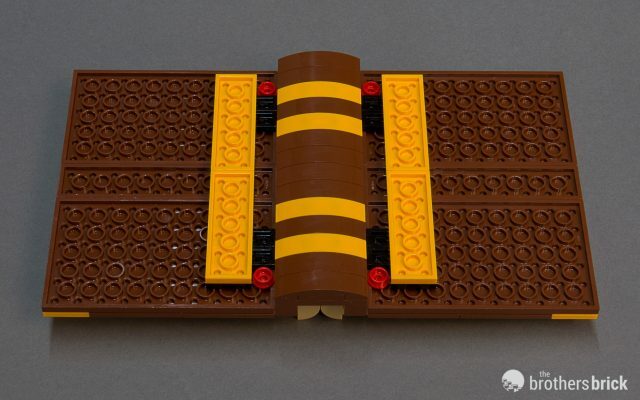 Or has anyone found links for directions and pieces needed to build them? They are adorable! 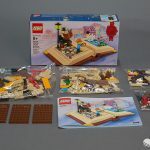 Would love to buy the needed pieces to put it together. I can sort of tell from the pictures but was hoping someone somewhere did it since I’m being lazy. Thanks!